Rogers, M.W., J.A. Kerns, D.B. Bunnell, R.M. Claramunt, P.D. Collingsworth. 2013. Exploring Life History Characteristics of Naturalized Versus Stocked Chinook Salmon. 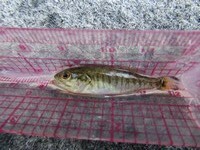 A Final Report submitted to the Great Lakes Fishery Trust. IP-061637. Sloss, B.L. 2012. Genetic identity of Wisconsin Gartersnakes using microsatellite Genetic markers. Wisconsin Department of Natural Resources Research Report Series. 23 p.
Sloss, B.L., J.A. VanDeHey, T.M. Sutton, P. Peeters, and P. Schneeberger. 2007. Genetic structure among Lake Michigan’s lake whitefish spawning aggregates. Final Report to Great Lakes Fishery Commission. 118 pp. Easterly, E.G. 2018. Brook trout movement and survival in the west branch of the Wolf River, Wisconsin. M.S. Thesis. University of Wisconsin-Stevens Point. 81 p.
hydroelectric dam. M.S. Thesis. University of Wisconsin-Stevens Point. 79 p.
zooplankton in northern Wisconsin lakes. M.S. Thesis. University of Wisconsin-Stevens Point. 119 p.